The much delayed and over-budget A400M aircraft finally flew for the first time last month. Airbus says it needs more money from European governments before it builds the A400M aircraft. (FT) -- Airbus is threatening to scrap its €20bn ($28.8bn) programme to build the A400M military aircraft, Europe's most high profile defence project, unless governments agree to come up with more money for it before the end of this month. "We need to stop this constant drain on resources," an Airbus spokesman said on Tuesday. "We've asked the governments to take their share of the burden and this needs to be done as soon as possible." Tensions have worsened in recent months as Airbus and its parent, EADS, have tried to persuade the governments to share the extra costs that have arisen thanks to the technical problems and delays afflicting the programme. 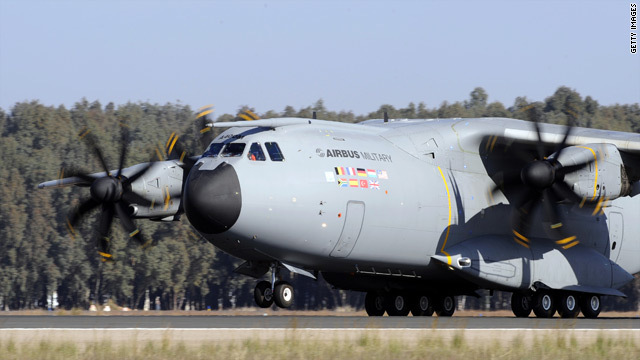 After EADS missed a key deadline to fly the aircraft earlier this year, putting it in breach of its contract, the parties came to a "standstill" agreement under which Airbus kept working on the A400M while funding and delivery negotiations continued. There have been three extensions of the negotiations over the last 10 months, but no agreement has been reached, leaving Airbus to bear costs of around €100m a month. The company spokesman said this meant the A400M was eating up "scarce engineering resources" that could have been diverted to Airbus's civil aircraft production arm. He said the company had done its part during the standstill period by solving the technical issues and getting the aircraft into the air and now it was time for the governments to share the burden. The manufacturer threw down an ultimatum to the governments on December 31, people familiar with the situation in Airbus and EADS said today, saying this would be the last extension of negotiations. EADS estimates the program will cost a further E11.3bn to complete, making the total cost of the programme E31bn. Of this, the company wants the partner governments -- Germany, France, the UK, Spain, Belgium, Luxembourg and Turkey - to accept a 25 per cent price increase, or E5.3bn. EADS, which has already taken a hit of E2.4bn, will then absorb the extra risk cost of E3.6bn, whch they hope to bring down by running the programme more efficiently. Tom Enders, Airbus chief executive, is looking at pulling out of the programme if agreement is not reached by the end of January, however the company is still some way away from this point and any final decision would be taken by EADS. Rather, the company is trying to force Germany, one of the more reluctant partner governments, to focus on the funding issue. "As a responsible head of Airbus, Tom Enders will decide how to secure the long term future of the company. A constant loss-making program is not healthy," the Airbus spokesman said. Despite Britain's reputation for scuppering collaborative procurement projects, the German government has consistently taken the most hard-line in negotiations with EADS, demanding that the company stick to contractual agreements. German defence officials note that the country has strict rules mandating parliamentary approval to sign or amend significant contracts. In 2002 the project was held up for a year while the partners waited for the German parliament to give the go-ahead. Still, a spokesman for the German defence ministry said Tuesday that it remained committed to A400M programme negotiations with Airbus and hoped to secure an agreement by the end of January. "We stick to the moratorium agreement and continue to clarify the necessary details for a continuation of the program with the industry until the end of the month," he told Dow Jones Newswires.